The best way to find the latest in applied topology are research conferences and browsing the webpages of researchers and research groups in the field. Rob Ghrist's Page: Has lots of great preprints on sensor networks, geometric and topological robotics, applied computational homology, and dynamical systems. Especially, see his preprints on expository papers. Much of the material in Topology and its Applications on robotics is based on Rob Ghrist's work. Afra Zomorodian 's Page: Has lots of great preprints on computational topology. Afra has a terrific book on computational topology (Topology for Computing). Much of the material in Topology and its Applications on computational topology and protein/cell structures is based on Afra Zomorodian's work. Peter Saveliev's Page: Has several projects in computational topology, with a preprint of a book on computational topology focusing on image analysis. Konstantein Mischaikov 's Page: Has several projects in computational homology, with sections of his book computational homology and great applicaitons to chaos and image analysis. Jim Sethna's Page: Has many applicaitons to physics with some great resources on physics, chaos, thermodynamics and material science. Jim Sethna has a fabulous book Statistical Mechanics: Entropy, Order Parameters, and Complexity, much of which are available from his page. Jim Sethna assisted with applications of Topology to condensed/soft matter physics such as liquid crystals and superfluid helium and other unusual phases of matter , in Chapter 5 of Topology and Its Applications. Computational Homology Project (CHomP): The computatioanl homology project at Georgia Tech has several applications in chaotic dynamical systems and phase seperation, with the CHomP software program forcomputing homology of cubical complexes. Stanford Graphics Group: Lots of nice computer graphics, much of it using triangulations for construct images of real objects. For example, see their Digital Michelangelo Project, using a laser scanner to make computer surface reconstruction (triangulation) of the statue. The "Stanford Bunny" statue in Topology and Its Applications was created by the Stanford Graphics Group, and the origintal data for the "head of David" figure comes from their Digital Michelangelo Project. Topological Methods in Scientific Computing Stastics and Computer Science: Lots of preprints on computational topology and computational geometry. Notably, the software Plex and Isomap are available here. Plex computes homology of simplicial complexes in Matlab. There is a lot of material that can be found by following the links on the TMSCSC page, such as Vin de Silva's page. Alice team at Loria: This research group has many nice publications on applicaitons of cell complexes in surface construction using topology and geometry, including some applications used by Renult in automibile engineering. See their publications link and their software link. Nicholas Ray of Alice provided many great figures for Topology and Its Applications, especially thosed involving index theory in computer graphics. Lavrentovich Group: A research group at the Liquid Crystal Institute at Kent State. See the 'Overview of Current Research Link' from the Lavrentovich Group's page to see the main ideas of topology in liquid crystals. Also, see the beautiful images at the bottom of the Liquid Crystal Institute's page. Oleg Laverntovich heads wrote a terrific books Soft Matter Physics: An Introduction and Defects in Liquid Crystals Computer Simulations, Theory and Experiment which have great material on topological defects in soft matter physics. Oleg Laverntovich Provided the image of a liquid crystal used in Topology and Its Applications. Cartan's Corner: Has applications of topology in physics. Acme Klein Bottles: Who doesn't love a glass Klein bottle! John Baez on Bott Periodicity: John Baez eplains why Bott Periodicity is a really strange part of the physical world. Baez's writtings are always fascinating, and this is a classic. Maybe there should be eight hours in a day! A history of Topology: A short essay on the history of topology. Knot Theory: The basics of knot theory. Knot Plot: An awsome program for plotting knots. 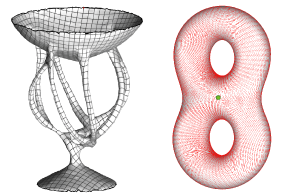 Most of the images of knots in Topology and Its Applications were made using knotplot, including Antoine's Necklace. CompuTop.org: A site with links to many many great computer programs for doing topology. If you've read through everything else in the world, you can go sort through the geometry junkyard to find more goodies.